Home > Booker Middle Outbreak Deemed Safe! Booker Middle Outbreak Deemed Safe! Thanks to a school-wide immersion grant from the Education Foundation of Sarasota County, with funding from United Way Suncoast, the sixth through eighth grade students at Booker Middle School have had a whirlwind few weeks—first planning and designing their own city, and then having to defend it from a sudden outbreak. Managing the herculean task with the help from Booker staff and faculty, the students also received quite a few helping hands, and useful words of wisdom, from several professionals throughout the community who stopped by the school to talk with them about all the different ways to contribute to their city. The project began one month ago, when students began building their city from balsa wood and pure imagination. Each classroom selected a particular building to study and design, based on what could most readily be adapted to the curriculum. One geometry teacher focused on architecture, using the discussion to talk angles and volumes and measurements. The drama class took the fire station, acting out scenes showing the many roles of the firefighter, from putting out fires to engaging the community. Surprisingly, the classroom that picked the hospital eschewed the obvious and invited not a doctor but an architect, who spoke about the differences between designing a hospital versus a home. 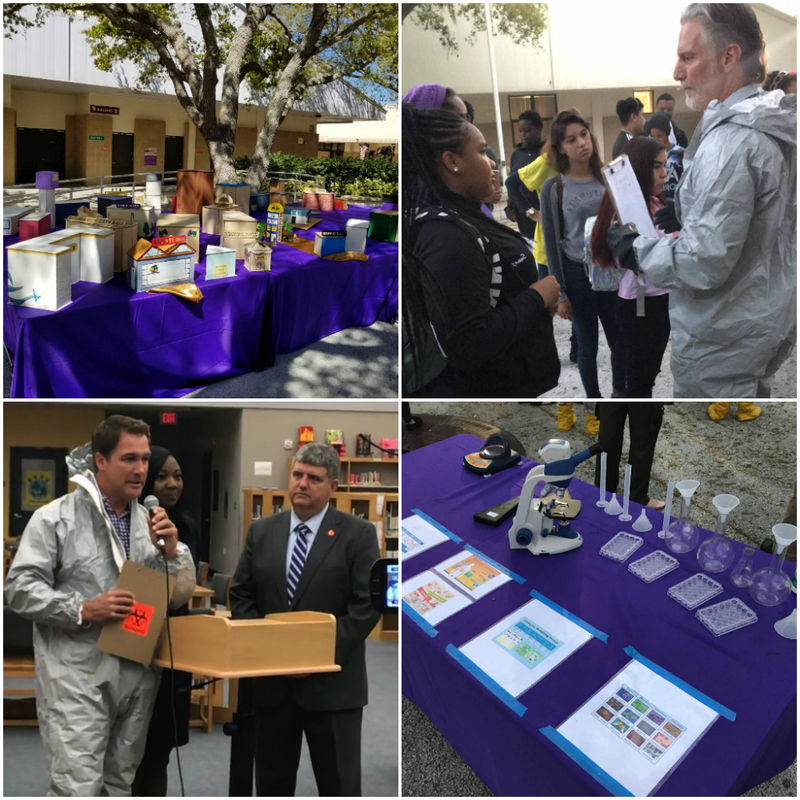 Other speakers included Bill Waddill, newly hired managing director of The Bay planning process, who asked students to design their perfect park, anchor Stephanie Webb from ABC7 and a pilot who talked about her path to the skies. 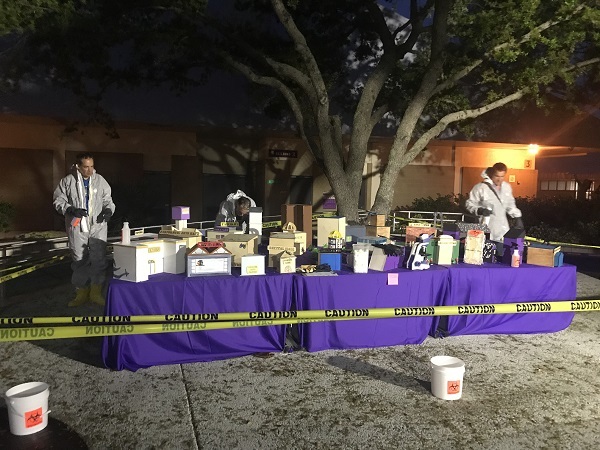 Part of being a professional means thinking on one’s feet, which the students had to do this past Monday, when they arrived to find hazmat suits on campus, and their principal, Dr. LaShawn Frost, and the Sarasota County School District Superintendent, Todd Bowden, announcing a bacterial outbreak in their newly constructed city. Working quickly, the students who ran the school news network had to scramble to get their cameras and microphones in place, providing regular updates to the school, while the rest of the student body got to work learning how to identify bacteria, how they behave and how to manage a city fearing a deadly epidemic. As the project continues, students will have many more opportunities to hear from local professionals, as the speakers continue to arrive in classrooms throughout the week, and then in the week following Spring Break. Bringing the parents into the mix, the project will also take over Booker Middle’s Thursday evening Parent University, taking a page out of the 2Gen approach to bring parents and students onto the same wavelength to encourage greater performance from all. Bolstered by the success so far, plans are already in the works for the next project, and rumor abounds that a meteor may hit in Venice.